Help keep the Forum going! We can say it's about probability. Indeed, there is a very small chance that it is pure coincidence that eg no Arabic script was found in the Petra Papyri or the pre-islamic Nessuna ones. Hardly any arabic was found in pre-islamic inscriptions. If it was widespread in Iraq, it would have been found without searching too much. The indication is there that pre-conquest, this script was not very popular. So much that for quite some time it was thought that the Quran was the very first work in Arabic script and the script was invented to write the Quran. Starting from the evidence of scarcity of pre-conquest Arabic and explosion of it post-conquest, what could be an explanation? Not necessarily as pre Islamic inscription are Christians. They've been erased as they bear crosses. Crosses mean idolatry. What one found is what had escaped. If it was crafted in monasteries, it was used more or less for religious purposes which slowly disseminated: 512/568 inscriptions, Negev inscriptions.He only imposed himself as a secular script from the Quranic texts which was written with it. Meaning that Quranic texts was written before 640 (PERF 558). So much that for quite some time it was thought that the Quran was the very first work in Arabic script and the script was invented to write the Quran. The Greek and Syriac with crosses was not removed but the Arabic was? Far fetched. Point here is also that you need special structures to keep a low intensity script going. Parents will not spontaneously teach their children, or children will not pick it up bc seeing it everywhere. It is almost as if a secret society kept the script alive (after a first experiment to popularise it failed? ), and with the push of the conquest, this script was promoted to reinforce the new power structures. Point here is also that you need special structures to keep a low intensity script going. It is almost as if a secret societyMonasteries kept the script alive (after a first experiment to popularise it failed? ), and with the push of the conquest, this script was promoted to reinforce the new power structures. I see the logic in it, from the Quranic text it seems the most logical explanation. But from the archeology of Negev, the papyri of Nessana/Petra, nothing shows any signs of Arabic pre-Islam in these monasteries. Do you have any reason to point to Iraq? I mean something concrete, not a string of assumptions. Why do you keep mentioning these dates: 512/568? Monasteries/secret society: one doesn't exclude the other. Histroy shows that monasteries often were breeding grounds of new ideas. Hello Altara ., What is your opinion on these Caliphs of Early Islam...?? 1). Do you believe in that above narration of early Islamic Power houses?? But from the archaeology of Negev, the papyri of Nessana/Petra, nothing shows any signs of Arabic pre-Islam in these monasteries. Greek was in the west. Monasteries/secret society: one doesn't exclude the other. History shows that monasteries often were breeding grounds of new ideas. Yes, but secret society is an anachronism. Warlords dressed as "Companions of the Prophet" 2 c. later. SO QUESTIONS TO YOU DEAR Altara., 1). Do you believe in that above narration of early Islamic Power houses?? Nope as they repeat 9th c. narratives. I got this idea from the article about secret Jewish Societies related to the Dead Sea scroll. Why anachronism? Zebed and Harrran inscription are multilingual. So having Greek didnt stop them having Arabic. I fully agree with you on those warlords and their story tellers in the name of Porphet of Islam "Muhammad" but is it not time for academics to inquire and clear these warlords and their real stories.? I mean why?? even many of those who question Existence of Muhammad would not even touch the subject of early warlords in Islam ..
but is it not time for academics to inquire and clear these warlords and their real stories.? I mean why?? even many of those who question Existence of Muhammad would not even touch the subject of early warlords in Islam ..
Because they are constitutive of the narrative. As such, none scholar investigate anything. They believe it. They are great believers. As such they do not question none of these attested "Companion of the Prophet" Ali or Muawiya who do not left any trace of their supposed life with the Prophet and their great life in Mecca/Medina/Kaba. Simply because all of this is fiction. That is the logical response. I agree it is fiction. But maybe some names are correct? Someone must have led the conquerors? But maybe some names are correct? Someone must have led the conquerors? The names (correct or not) were dressed as "Companions of the Prophet". From the sources one knows at least that Muawiya and Ali are corrects names. Both are connected to martyria, Is more known about what exactly was going on in these martyria? Did certain texts come out of there, were certain activities developed there? Hi mundi .. where did/do you read about those inscriptions? do you have any link on them apart from islamic awareness.org?? "None of the scholars investigate anything. They believe in narratives. Harran and Zebed inscriptions: they are mentioned in all articles about arabic epigraphy. Islamic awareness gives a handy overview. Why do you want more info? What is your idea around these inscriptions? ...............Why do you want more info?... What is your idea around these inscriptions? well it is good to know what they published w.r.t inscriptions and how "SCHOLARS" interpret them.. but more important is your 2nd question which covertly or overtly comes in to the field of "Science of dating objects" from ancient times.. and that is my interest ..
Issue is sources are scarce and not so crystal clear so it is easier to cling to the muslim narrative. Yes, easy way out as they believe the narrative as historical whereas they have no validation of it. On those words of mundi .. let me add some links..
We Refuse Dates That Contradict the Bible For the following important reasons we refuse to accept archaeological dates that contradict the Bible: First, the Bible has demonstrated its accuracy in the face of the most vicious assaults, whereas the skeptics have been proven wrong consistently. and the Philistines, of Sargon and Nebuchadnezzar and Belshazzar, to name a few. Tey said that the book of Acts was flled with historical inaccuracies. In all of these cases and hundreds more, the skeptics were wrong and the Bible was right. and that is the stone.. Hmm.. Bible must have written in New Mexico.. otherwise how is it found in US of A and the stone is dated for biblical times...?? That is a s problem, and in your list you obviously show some fakes. The Harran and Zebed inscriptions seem to be reliably dated, but always good indeed to keep in mind it could be wrong. I think it is an example of the diversity of ideologies of post-antiquity. Coming back to the Quran, why not a group of people under sponsoring of a mecenas coming up with a text in an almost secret script (Arabic). Only a small group of litterati (the ones reading Arabic, which was an almost secret society), knew the contents. Script was later divulged amongst more leaders, without probably the holy text (Quran) being read and known by them. That is a s problem, and in your list you obviously show some fakes. ..
did you come across any publication that has highlighted Arabic inscriptions before Islam say between 3rd century to 6th century in the present Shia geographical area such as Iran, Iraq(Near the border towns of present Iran .. Basrah.. Amarah ..) and present Yemen ?? 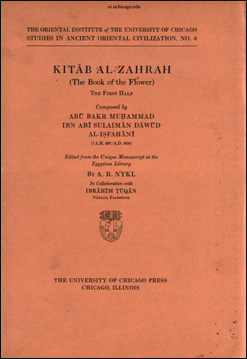 Kitāb al-Zahrah (The Book of the Flower). The first half that book was composed by Abū Bakr Muḥammad Ibn Abī Sulaiman Dāwūd al-Iṣfahānī (A.H. 297/A.D. 909). Edited from the Unique Manuscript at the Egyptian Library by A. R. Nykl in collaboration with Ibrahim Tuqan. 9¾ × 6¾, pp. viii + 406. Chicago: University of Chicago Press, 1932. 11s. Ok, explain yourself further. What point do you want to make? dear mundi that is such a great question... great point ,,,,,, I am pulling my hair to answer that general ..... question/point ........... to my self (NOT TO YOU)., it is indeed tough..
What is the purpose? what point am i making by writing posts and asking question when i have gillion things to do? .... Woff .. difficult one..
As far as this point / questions for you concerned ., the logic behind is very simple..
2, did you come across any publication that has highlighted Arabic inscriptions before Islam say between 3rd century to 6th century in the present Shia geographical area such as Iran, Iraq(Near the border towns of present Iran .. Basrah.. Amarah ..) and present Yemen ?? So question to you was were there any prominent Christian /Jewish /Roman monasteries or prominent centers in these countries during early Islamic times ... and that is related to Quran..
We must realize Quran is a simplest book., it is a book of individual stories based upon OT/NT and bit of pagan stories that were floating around middle east .. The book is like a George Bernard Shaw play The Doctor's Dilemma .. It is mainly a book of dialogues ., So many of these stories of Quran could have been written anywhere not necessarily in Syria or in Petra or in Jordan or in Israel/Palestine .. The Roots of Muslim Rage Why so many Muslims deeply resent the West, and why their bitterness will not easily be mollified by BERNARD LEWIS SEPTEMBER 1990 ISSUE .. that 30 year old article still fits well..
Karen Armstrong: "There is nothing in the Islam that is more violent than Christianity"
Yes, Karaism is an interesting thing. Somehow, it could be very tempting to see it in relation with the Quran. But it seems appears after the 7th c. I think Dye thought about it. Ground this with available sources. 1.) ............So question to you was were there any prominent Christian /Jewish /Roman monasteries or prominent centers in these countries during early Islamic times ... and that is related to Quran..
2). ...... it is a book of individual stories based upon OT/NT and bit of pagan stories that were floating around middle east .. So you did not like me saying . "Jewish monasteries" right?? correct me if I am wrong dear Altara.. So question to you now .. Were there any Jewish Monasteries from Jewish sects in the middle east during the time between say.. some 100 AD to 500 AD?? Monasticism .. a word that is originated from Greeks("mono" means "alone") or living life alone ... or "monkhood" is a religious way of life in which one renounces worldly pursuits to devote oneself fully to spiritual work. ..
but but .. again Altara .. let me repeat the question .. were there any Jewish sects that were practicing some sort of Monasticism or Monastic way of life with in Jewish faith of that time .say between 1st century AD to 5th century?? Anyways murders mayhem everywhere in the name of faith .. life is tough and it disappears .. but what one has to do ONE HAS TO DO... and my goal is to educate folks and arguing with folks that follow the posts of my good friend Akay.. Akii in this forum and in the world wide web..